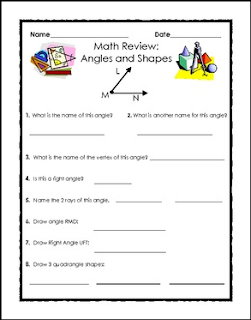 This lesson asks students to provide the name, rays and vertex of a given angle. whether or not the given angle is a right angle. This can either be used as a morning warm-up, math warm-up, homework, in-class practice, quiz or test. Elementary Geomentry Review: Angles, Shapes and Perpendicular Lines by Felisa Williams is licensed under a Creative Commons Attribution-NonCommercial-NoDerivs 3.0 Unported License.